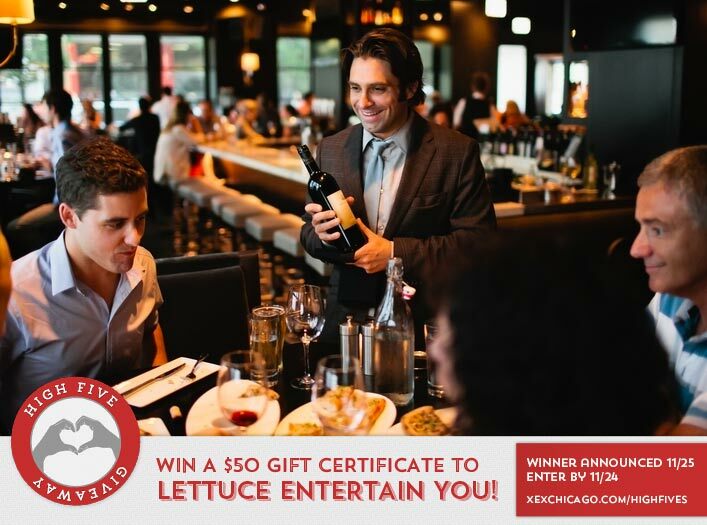 Win a $50 Gift Certificate to any Lettuce Entertain You Restaurant! Congratulations to Terri LaMont on winning our 141th High Five Giveaway and thank you to all who entered! Our next High Five Giveaway is for a $50 gift certificate to Lettuce Entertain You. You can use the gift certificate at any of their restaurants. Since 1971, Lettuce Entertain You Enterprises, Inc. (LEYE) has maintained a sense of humor and enjoyment while creating high quality, successful restaurants. Due to the innovation of LEYE’s Founder and Chairman, Richard Melman, and his creative team of partners and employees, LEYE currently owns, licenses or manages more than 100 establishments in Illinois, California, Arizona, Maryland, Virginia, Minnesota and Nevada. In Chicago, their restaurants include Big Bowl, Cafe Ba-Ba-Reeba, Everest, Hub 51, Maggiano’s, R.J. Grunts, Three Dots and a Dash, Wildfire and others. Visit their website at www.leye.com to view the complete list. When you refer a friend to XEX, how much of a discount do both you and your friend receive? Now, just add a comment to this post with the right answer to be eligible to win! The winner will be announced on Wednesday, November 25. Entries must be received by midnight on Tuesday, November 24. Each will receive a 30% visit off for hair or make up. Each will receive a 30% visit off for hair/make up.